casting my vote in the Legislative General Election (as reported by my brother, Taufan, in Bahasa Indonesia). Anyway, it was my Grandmother who told me about Kopi Luwak for the first time. As far as I remember, I was a very very small kid when she said to me that Luwak can make a very good coffee. It was B.G. (Before Google) and I was a very very small kid, so I totally have no idea at all, how Luwak looks like. 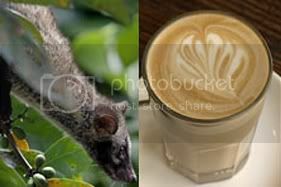 But now, thanks to Google Images, a search with Luwak keyword will give you plenty images of Luwaks, their feeces + coffee, the packaging of Kopi Luwak, and surprisingly, Oprah Winfrey 🙂 . The problem is, where can I get Kopi Luwak in Jombang? I like coffee, but I never drink Kopi Luwak. Neither do any of my family members. Fortunately, my Father had heard before, that there are Kopi Luwak’s sellers in Kediri or Blitar. He made few calls, but none of them gave us good news. Running out of time, I settled with Bandung Presto. And my friend seems content for receiving Bandeng Presto, instead of Kopi Luwak. So here I am now in Singapore, I am still curious about Kopi Luwak and decided to google for it. I found David Emery wrote that Kopi Luwak is not a myth. But do beware of the fake Kopi Luwak. I had my doubts until I learned that University of Guelph food scientist Massimo Marcone actually trekked to Indonesia a few years back to collect samples of kopi luwak beans with his own two hands, supplying independent confirmation that this rare and exceedingly expensive varietal coffee really exists. Marcone figures almost half the beans marketed under the name “kopi luwak” are either adulterated or fake, however, so buyer beware. Honestly, though, this coffee doesn’t really live up to the hype. There’s not a flavor so unique here that you couldn’t find something just as good in Starbucks. If you look past the preparation process, the coffee tastes like nothing more than a strong blend of hazelnut. It wasn’t a bad cup of coffee, but it wasn’t so good that it was worth seeking out. This is purely a novelty delicacy prepared solely to give someone bragging rights. And finally, the clear direction to the Kopi Luwak Farm in East Java. JudeAngel wrote an article about Kopi Luwak at TuguPahlawan.com. Unfortunately, it is in Bahasa Indonesia. Lebih menarik lagi, PTPN 12 juga menawarkan wisata Agro di perkebunan Kopi Luwaknya. Berlokasikan di lembah gunung Ijen, pengunjung dapat menikmati keindahan kebun strawberry, teh dan kopi, sekaligus mengamati cara “pengolahan” kopi Luwak, langsung pada tempatnya. Dibuat dengan konsep cottage, tentu saja sangat asyik untuk jadi tempat tujuan wisata. Hmm.. interesting. Now I know that Indonesia’s state company (PTPN 12) has an Agri-Tourism offering. We can book cottages that are located in the valley of Mount Ijen. The cottages are surrounded by strawberry field, tea field and coffee field. Nearby, we could watch the process of producing Kopi Luwak. You might want to check out the reservation page, to see the cottages. Interesting, I think I just found destination for my family’s next retreat. You could see more pictures of the Kopi Luwak farm at http://www.javakopiluwak.com/. It’s quite far from Surabaya. Mau yang lebih dekat lagi? Coba saja mampir ke Cafe Rollaas di City of Tommorow. Mereka menyediakan produk-produk yang langsung didatangkan dari perkebunan PTPN 12, termasuk Kopi Luwak. Kalau mau mencicipi Kopi Luwak, harus siap-siap nabung dulu. Secangkir harganya Rp 100.000,-! Tapi dijamin worth it dan kalau sudah mencoba, pasti baru percaya, mengapa kopi ini begitu istimewa. Selain kopi Luwak masih ada kreasi-kreasi minuman lainnya dari kopi, teh, coklat dan strawberry. Tempatnya juga nyaman dan cozy. dan yang terpenting: ada free WiFi! Alternatively, we could visit Cafe Rollas at the City of Tomorrow. This Cafe offered Kopi Luwak for Rp. 100.000,- ( about SGD$15) per cup. The Cafe also offered other kind of drinks, creatively brewed from coffee, tea, chocolate and strawbery. With free Wireless Internet and cozy place, it could become a very cool place to hang out. Below is the map to City of Tomorrow. It is quite near to Juanda Internation Airport, Surabaya!!! Have you drink Kopi Luwak before? What do you think? Since Kopi Luwak is found only in Indonesia I recommend to purchase it from trusted seller from there. www.realkopiluwak.com send fresh roasted Kopi luwak to Singapore. In the site you can find plenty of information about this rare coffee. Marcel, Thanks for the info! The Kopi Luwak from realkopiluwak.com was superb and it has arrived quiet fast. Highly recommended. just call me if you need the real kopi luwak sumatra, the best from all of indonesian coffee. Last time I bought a coffee covet after searching through the internet and found http://duta-kopi-luwak.blogspot.com after I went to the location of his ranch, was more authentic civet coffee at the ranch is in my opinion because the animals are fed Luwak coffee fresh fruit and then selected himself in the cage. system is still very traditional to wear a very rare one for the metropolitan,. price at the farm are very affordable. I mean not like in other farm animal feed luwaknya way system using random or from the rind of fresh coffee is opened first and then mixed with banana pulp. thank you to Mr. Mega Setiawan http://duta-kopi-luwak.blogspot.com to always maintain the authenticity of Civet coffee and your service as long as I review the location of your farm. suggestions for better friends see civet farm system in order not to be deceived, my recommendations should contact Mr. Mega Setiawan from Indonesia in http://duta-kopi-luwak.blogspot.com for direct review ranch location.